Want Imminent Danger Swag? Email Me! If you want Imminent Danger swag, email me with your address and I’ll send you some! Before anyone gets overly excited, we’re talking bookmarks and stickers here, people — not, like, a pony with my book cover shaved into its side. That’s animal cruelty, which is very bad. Shame on you. So if you want some ID swag, email me (michellishelli@gmail.com) your address, and I’ll do my best to make it happen. Obviously if I get 500 emails (unlikely, but I’m allowed to dream too, dammit! ), I won’t be able to send out swag envelopes to everyone, so we’ll say this is a first come, first serve offer. Now fire up that inbox and send me all your juicy personal information! Irony quotes around some of those potentially convey information, moving the situation from a lie to caveat emptor. I have no idea what the third option betwixt watching and not watching would be. The camera is pointed at you but the resolution is too low for usable detail maybe? The one that alarms me the most is “Sprinklers” throughout building. If they aren’t sprinklers, what the heck are they? Possible answers range from tediously dull to potentially life-threatening. A sprinkle of bullets via an automated machine gun turret, for example. 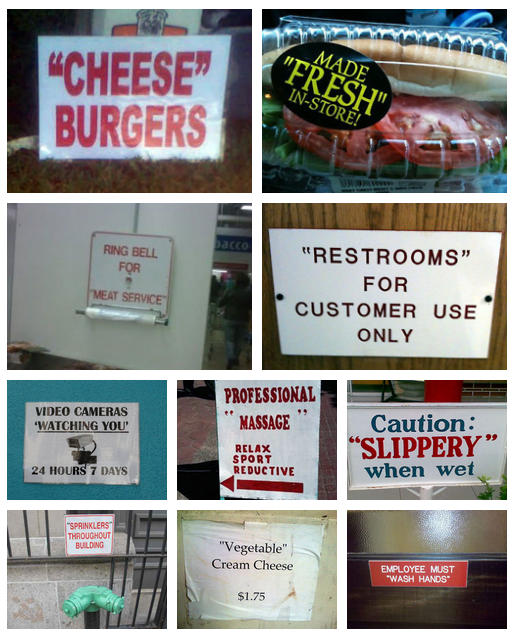 Some of those signs hurt my head as much as my eyes. So much ridiculousness! Email me! Do it! I’m mailing off a batch of letters probably tomorrow, so get your order in before it’s too late 😛 The “meat service” one is definitely more suggestive than they intended, lol. I wonder if they ever got any English tourists going up and trying to discretely inquire what it actually means.